ANIMAL LOVERS enjoy camp at the Los Angeles zoo. Summer will be here before we know it! In our house we like to mix downtime and activities—some time to relax and some time for structured programs. Luckily, in Los Angeles we have so much to choose from. Aloha Beach Camp: Classic beach camp in Malibu. Barnsdall Art Center: This local favorite in Los Feliz offers all kinds of unique classes for kids at reasonable prices. California Science Center: The museum near downtown has a wonderful summer program. Children’s Arts Institute: West L.A. and Studio City locations with terrific art program. Campbell Hall Sports Camp: Studio City campus has wide range of sports activities. Fitness By The Sea: Santa Monica beach camp filled with adventures and activities. Super Duper Art Camp: L.A. based super creative art camp. LACMA: The Los Angeles museum has popular summer classes that fill up quickly. 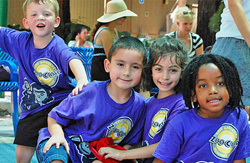 Los Angeles Zoo Camp: The zoo has wonderful day programs for animal lovers. Rainbow Camp: Day camp in Brentwood that’s been around for more than 30 years and is loaded with fun activities. Smart Space @Culver West: Alexander Park Recreation Room, fun park program. Tocaloma Day Camp: Popular day camp held at Berkley Hall School. Natural History Museum: Classic science camp. Shelly Leinbach: My daughter loved Sunshine Volleyball Camp last summer and will do it again this year. My son goes to Gene Malin’s Tennis Camp. They will also do academics for 30 minutes during weekdays. Marina Magnano: UCLA camps have been great for my boys. We tried swim camp last year there and it was awesome —well-organized, great counselors. Angelique Campen: We like to have a good mix of fun, but also not let the brain get too filled with cobwebs. My three children are doing a combination of fun but also academic classes at Marlborough summer school. All three are also going to Golden Arrow Camp in the Sierra Mountains where they swim, ride horses, sleep in tents and under the stars, hike, and really get to be kids! Vanessa Herman: I am always torn between giving my daughter a chance to completely relax and giving her the opportunity to get better at something. The five weeks she will spend at Marlborough this summer are a good compromise. She will get to fool around in the pool and improve her drumming with daily private music lessons in exchange for a reading comprehension class.